The Shenzhou 9 crew seated shortly after landing. The crew is no longer experiencing dizziness or the other sideeffects of microgravity (Credits: CCTV). 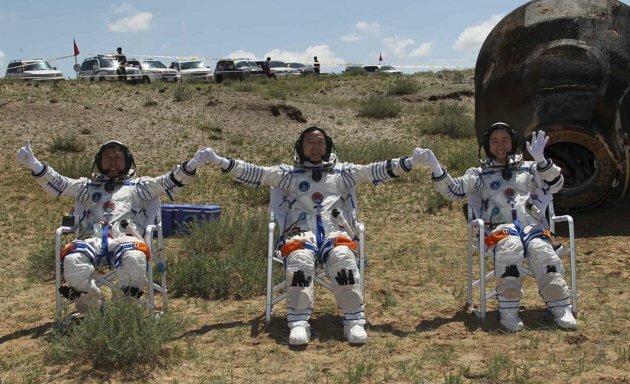 The crew of Shenzhou-9, including China’s first female taikonaut, Liu Yang, had their first public appearance on Friday 13 July, 2012, since returning to Earth. The crew had performed the first Chinese manned space-docking mission, and the first visit of a crew to the orbiting Tiangong-1 space lab module. Following the 13-day space mission and two week rehabilitation, the trio is in good health. The major consequences on the human body of changing from the constant 1G environment of Earth to weightlessness are fluid redistribution, inter-cranial swelling, and bone and muscle loss. Back on Earth astronauts usually suffer orthostatic intolerance, which means they get dizzy when they try to stand up from a prone position. According to Shanguang, the trio will get further rest at a sanatorium which practices traditional Chinese medicine. Their health will be observed for another three months to identify any medical condition resulting from their spaceflight. The taikonauts are already looking forward to their next manned space mission. With the success of the Shenzhou-9 mission, China has achieved their first manual space docking between the Shenzhou spacecraft and the orbiting Tiangong-1 module. This makes China the third nation developing such capability. Launched in 2011, Tiangong-1 is a prototype for the larger space station China is planning to develop. Tiangong-1 is expected to remain in operation as a test platform for at least two more years. The Shenzhou spacecraft, developed by China, is largely based on the Russian Soyuz capsule. China has developed many of its capabilities without international support and under trade restrictions such as the International Traffic and Arms Regulations (ITAR), which limits China’s access to know-how from the United States. China’s next steps are to continue utilizing Tiangong-1, launch another three person crew aboard Shenzhou-10 in 2013 followed by the development and launch of a larger space station by 2020.